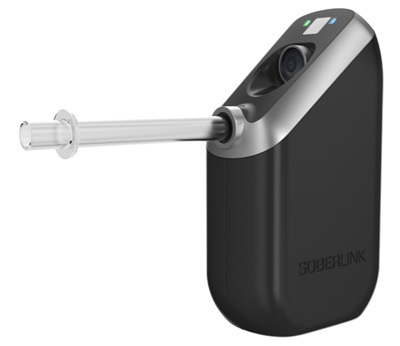 SOBERLINK SL2 is a mobile, one-piece, hand-held remote alcohol monitoring device which measures Breath Alcohol Content (BrAC) by collecting deep lung breath samples. SOBERLINK SL2 incorporates photo identity verification, evidentiary-grade fuel cell technology and GPS points to ensure the client is accurately identified and test-ed. Test results are promptly reported to the central monitoring computer system via a cellular connection. Each test report includes a high resolution client photo, BrAC reading, GPS location and time and date stamp to ensure accuracy. Alcohol monitoring with SOBERLINK SL2 allows low-risk clients to be monitored remotely with the resulting test data submitted wirelessly. The high resolution internal camera includes a flash to enable capturing pictures in low-light or dark spaces. Multiple acquisition technologies determine device location for each test. Client communications, including battery status, text messages and test directions are conducted through a high resolution color LCD screen on the side of the device.